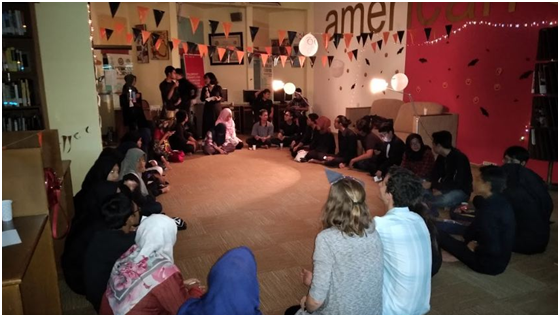 UNAIR NEWS – In the eve of Halloween celebration, troopers and visitors celebrated Halloween night at the American Corner, Campus B UNAIR Library. Wearing cosplay dress code or dark clothes, visitors enjoying Halloween night with various events arranged by the troopers. The event, which was held from 4 pm to 7 pm, had a fun Halloween vibes with music, videos, games, and various shows. American Corner was decorated with with various Halloween decorations, such as pumpkin, bat, ghost and some Tumblr lights which gave a real Halloween atmosphere experience. Moreover, a variety of Halloween treats like chocolates and candies were provided for visitors. Thus, visitors could also enjoy all of the treats. To enliven the event, all Amcor’s troopers also performed various shows like singing and dancing. Although, the songs and dances were not related to Halloween-themed, they performed it as a celebration for the first time event held in American Corner. Peppy Rahmawati, a Law Faculty student who was also a Troopers at Amcor expressed her joy for the success of Halloween celebration yesterday. “Since, I have never made an event like that, with our accomplishment yesterday it was really awesome. Although, they only know each other a few months and rarely meet but this is beyond our expectation that we can make this event awesome” said Peppy. Interestingly, besides the troopers, the visitors who were there also enjoyed this event. They also participated to sing. They can choose their favorite song and sing along with others. Since there were a few activities, the main thing that should not be forgotten is when the game was started. One game that has its own charm from the whole event on the night of Halloween was the Werewolf game. A role play game that required you to trick people’s mind, usually this game needs several people to play and one moderator who lead the game. The participant will get a role choosen based on random selected card. All participants will be divided into several roles as Villager, Guardian Angel, Drunk, Seer, Werewolf and Sorcerer. They followed this games rule very well while also enjoyed the intense vibes; dim light and Halloween music atmosphere echoed in all corners.